Normally, not even drunk on a bet would Violet Parker go to Slagton, a creepy ghost town inhabited by those too stubborn - or deranged - to leave. But a certain bullheaded Deadwood detective has a problem - his informant from Slagton has gone missing. When Violet is shanghaied into taking a hunting trip to the ghost town to search for the missing snitch, she stumbles into trouble that will take more than a double-barreled shotgun to escape. ©2018 Ann Charles (P)2018 Blackstone Audio, Inc. This series is good, it’s really good to listen to the characters relationships unfold and that friendships can be forged between women and men without the love triangles that normally happen. Definitely start at book 1. The paranormal aspects builds over time. Great relationships and family make everyone seem normal. There is a cast of quirky characters which makes the journey so much better. I love Harvey and Cornelius. Prudence is pretty funny in a scary sort of way. The story keeps building. Can't wait for the next one. I really like the narrator's delivery. I switch between audio and text. I willl re-read the series. I absolutely love this series! The characters that Ann Charles has created and woven into this hilarious mystery series are unique, memorable, quirky, and lovable. I am truly amazed at the story-lines this author comes up with as she pits them her characters against the evils of another world, and sometimes against each other. I love all of the characters in this series and love stopping back in Deadwood to visit with them. Life is never dull in Violet's world, that's for sure. Gone Haunting in Deadwood is book #9 and one might think that a series that has gone on that long might get kind of stale and repetitive. But this series is anything but that. The relationships of the characters have grown and developed with each book—there is definitely nothing stagnate there. And Violet and her crew are constantly coming up against different creatures and learning new ways to conquer them. I have to hand it to Ann, she has one crazy vivid imagination! 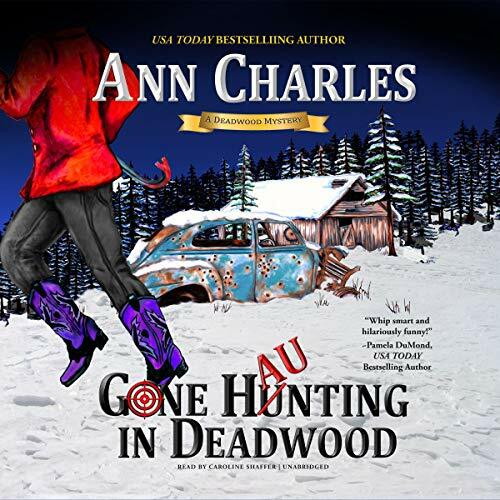 I listened to the audio-book of Gone Haunting in Deadwood, as I have all of the other ones in this series. The narrator does an AMAZING job and I just love listening to this series on audio. Great mystery fantasy romance strong female lead kinda book. And just the right amount of swearing to make you smirk and steam to make you check to make sure its not audible to anyone else. Great, I'm so happy Violet told Mona her secret. Awesome details - latitude and longitude!!! Ann Charles Rocks It Again!! Absolutely loved it!! I adore the characters and am thrilled that the have so many hang ups and foibles. I love this book but sorry this story line is about to end. It’s a fun audible to listen to while driving to and from work. Will have to try one of her other story lines. Love this series and this book did a lot to move the story along. Can't wait for the next installment.